Apartment block built between 1906 and 1910 in Barcelona for the Milà family. The façade is an impressive wave-like mass of rough-shipped stone. The windows and doors seem to be dug out of this stone mass and are trimmed in exquisitely crafted wrought iron work with vegetal forms on the balconies and astonishing grilles on the two street-doors. On the stepped terrace, coming as an elegant surprise are the huge stair exits of sculptured spirals and faced with broken ceramics and marble. The chimneys bring to mind knights wearing visors. All of this makes up a fantastic and futurist space. The interior marine decoration - ceilings, columns and the furniture designed by Gaudi for this house are extremely modern. The Mila apartments measured 1,323 squares meters, a really vast place. 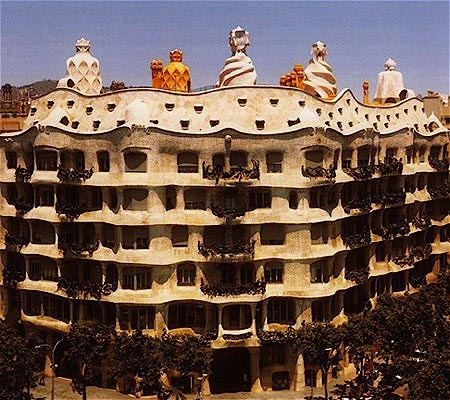 Casa Milà was classified as World Heritage in the1984 UNESCO Catalogue.